Nike's marketing pitch: Maximum cushioning for an unstoppable run. 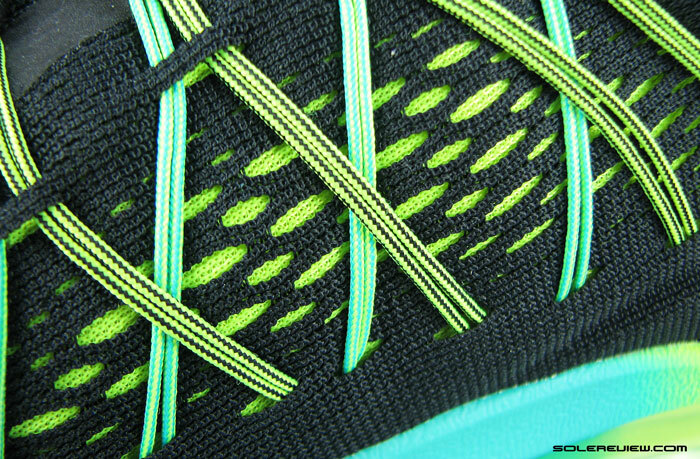 Upper: Engineered mesh, Flywire cord based lacing, inner sleeve. 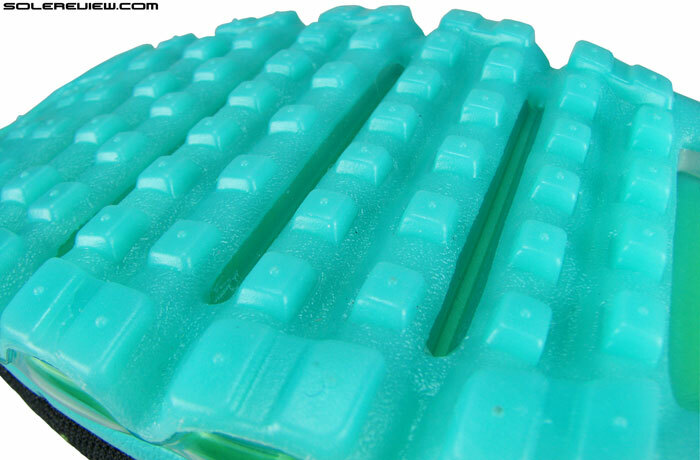 Midsole: Compression molded foam, full length blow molded air bag. 13mm heel drop. Widths available: Single, but 'wide' available when customized from Nike ID. Nike's most expensive shoe isn't its finest, yet looks unlike none other. This year's edition comes with a brand new upper, and carries over the same sole unit. Non-foam cushioning systems came into existence because they wanted to replace, well, foam. How times have changed. Nike Air. Saucony Grid. Reebok Hexalite. Asics Gel. These are well known cushioning technologies, and for long been a selling point for the brands. But first, we have to understand how these Vanguards of old came into being. In ancient days, running shoes relied on a very basic material to deliver cushioning; the humble, die cut EVA (Ethylene Vinyl Acetate). Unfortunately, things weren’t as high tech as they are today, which meant that EVA foam had the tendency to flatten out fairly quickly, losing any little cushioning it had to begin with. To give credit where it’s due, Nike, the undisputed marketeer of many things mesh and foam, was the first to recognize this as a problem. When they set out to do something about it, they came across the idea of putting air bags inside the sole of a shoe – an idea pitched by ex-aerospace engineers named Frank Rudy and Bob Bogert. Our Air Max 2014 review talked about this in detail, so we’re not going to repeat that story. We’ll sound like a broken record if we do. Nike’s adoption of a midsole insert spurred a new war between brands, with each going around town telling how superior their version was. And how these would not break-down like foam, and continue providing cushioning for a long time. No shoe advertisement was complete without an exaggerated mention of whatever cushioning technology went into the shoe, pretty much the same way how smartphone companies try to sell you powerful processors, battery standby and screen size. Many of the cushioning systems worked as marketed, and continue to do so. But things have changed of late. This isn’t the time of Chuck Norris movies and neon signboards anymore, and midsole foam has truly come of age. The same foam which was repeatedly spoken in the past as a thing to be despised is showing conventional cushioning systems the factory door. Brands like Nike seem to recruit as many material researchers and scientists as they do avant-garde shoe designers, with the end result of serious looking ladies and gents poring over foamy concoctions(among other things) in their labs. A quest to seek out the ultimate midsole foam formula, if you will. The Nike Lunarlon foam is a sign of the changed times, with many of their models coming stitched and assembled with it. 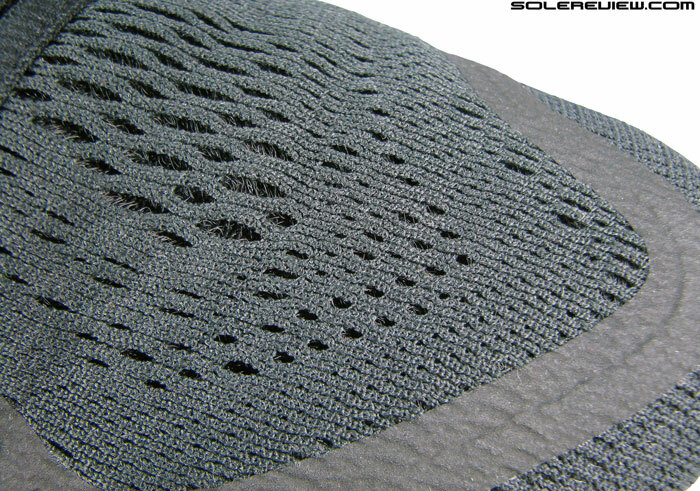 Saucony’s grid isn’t a trampolining ‘grid’ anymore, replaced by perforated midsoles literally filling in. Brooks is in the process of replacing their DNA gel insert with a foam of the same name. And adidas, which suffered throughout the years due to lack of an (marketable) embedded cushioning unit (Formation does not count) is finally making up for the lost time with Boost. And Hoka is killing it with an illegal excess of bottomless foam midsoles. Reebok is a lost kid in the woods going around in circles; and filling a New England cream pie with Sauerkraut for survival isn’t going well so far. It would be safe to say that insertable cushioning platforms are a breed of footwear dinosaurs, watching one of the lights in the star lit sky becoming brighter by the night, and making the air increasingly warmer. The gradually depleting count of Nike Air featuring running shoes supports that trend. Ok, Zoom Air is holding out on its own, but that’s also evolving, going by what’s plugged on the Lebron 12 and Hypercross Trainer. The full length Air Max series turns 10 with this shoe. Except for full Max Air, which seems to defy this phase of selective extinction. Launched in 2006 as a shoe to completely replace foam , it is going strong with consistent, annual refreshes. It has evolved down the years, and the midsole isn’t 100% foam free anymore. For the last few years, a Cushlon foam-bed performs as a secondary layer between the upper and blow molded, full length air bag. Last black friday marked the release of the 10th evolution of this model, with a new Flywire cord based upper teaming up with novel aesthetic detailing on the bubble-like midsole. So what newness does the Nike Air Max 2015 bring this year? Not a great deal, we’re afraid. The shoe might sport a brand new upper look, but is still based on the same 2014 Air bag unit. The new upper looks aesthetically striking and so does the treatment of the Max Air bag, with graphic prints and color graduation featuring for the first time on this model. Obviously, cosmetic window dressing makes no difference to the midsole functionality whatsoever, but the change in upper design results in a couple of fit related tweaks. One which we liked, and another which we did not, and in due course we’ll call out both for whatever you think it’s worth. The Nike Air Max is the brand’s most expensive running shoe, but not necessarily its best. Solereview is all about performance, and from that perspective, our overall impression of the Nike Air Max remains unchanged. Nike’s most expensive running shoe isn’t one of its finest; it is an average running shoe at most, bested by many cheaper alternatives from its own line and competing brands. The ride is firm, regardless of what marketing spreads would have you believe, and the upper isn’t the plushest considering the shoe leaves you poorer by two $100 bills. So if you’re looking for a runner which combines great cushioning, transition and overall comfort, then you’re better off giving this shoe a wide pass. On the other hand, if you find the allure of a see-through midsole irresistible, and want something unique to do your easy running duties in, then by all means go buy it. Just know that the Air Max 2015 is Nike’s trick pony, much in the way adidas Springblade is. Not much running talent to show for, but comes with impressive sneakerdom hype and a bit of blue blooded lineage, given that it is a maximal form of Nike’s successful Air technology. So with that out of the way in plain words, time to take a closer look at what the $190 shoe packs in. Brand new Flywire based upper, and the 2014 Air Max midsole carries over with some dressing up. As aforementioned, Nike has decided to carry over the exact same 2014 midsole to 2015 without any structural change. Full length Air bag, Cushlon foam above it, and a translucent, full coverage rubber outsole which is also quite thick. Back in the day, Air Max 360’s (as they used to be called then) had a soft underbelly. Unwanted results followed, with Air bag punctures being common place. Ever since, Nike has taken no chances, choosing to reinforce the bottom with a thick sheet of rubber. 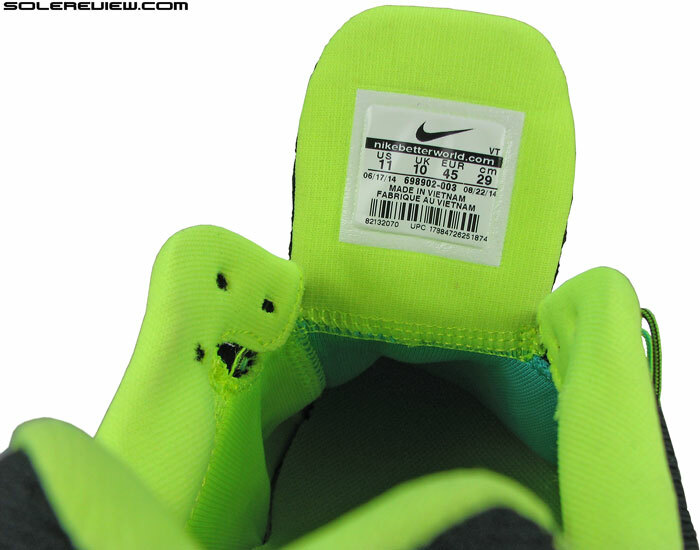 The insole is another shared part with AM2014. 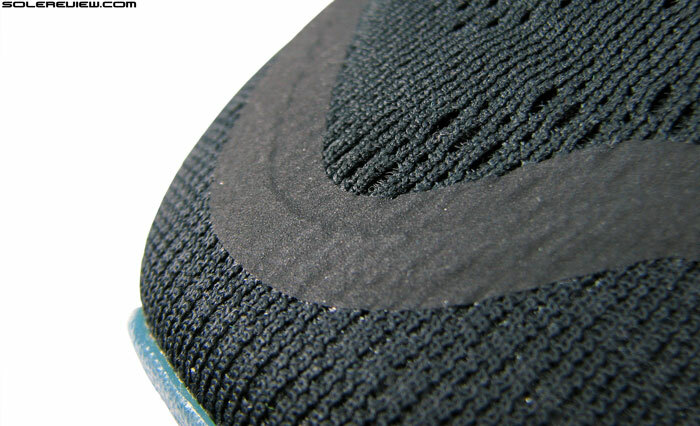 Cross section of the molded foam midsole zoomed in. EVA foam strobel sheet between the insole and midsole. Insole is the same as what was the year before, a few millimetres of anatomically shaped foam placed over the strobel and midsole. This adds a layer of responsive softness to what is a firm ride, and would be mistaken by some to be the cushioning coming from the Air bag. 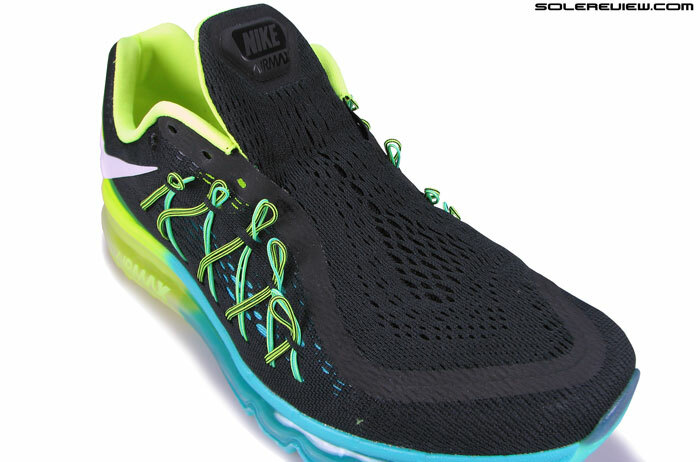 Nike Air Max 2015’s pressurized midsole delivers a firm quality of cushioning. The full length air bag is tightly pressurized, and feels firm during runs. That’s because there is no inherent softness, cushioning happens when you displace the air inside the chamber with each landing. However, the tightly sprung Air bag has limited freedom to splay – both because of high gas pressure within a confined space, and the support pillars preventing the heel from sinking in too much. The stiff outsole doesn’t help much in cushioning too, as they completely lack articulation or grooves under the heel. So what you finally get is cushioning spread over a much larger area – as opposed to the localized sensation of softness you get from foam midsoles. Deep, forward flex channels helps the shoe in the bending department. Forefoot flex grooves when seen from the side. Transition is one of the better areas, as material sameness underneath the foot helps the weight transfer feel uniform. Flexibility isn’t bad either, as deep grooves are inset within outsole forefoot, helping that area bend better. 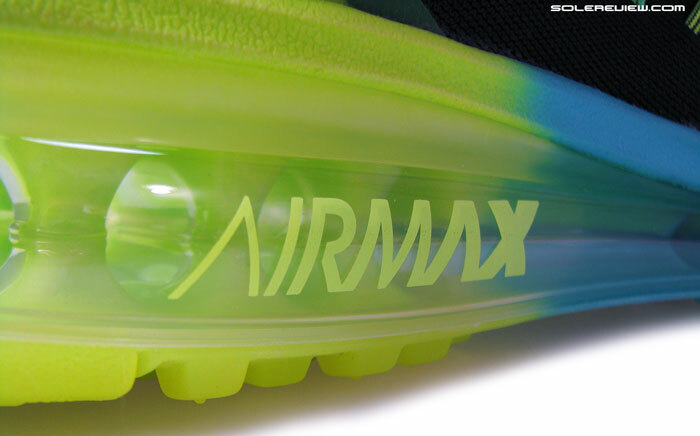 The Air Max 2015 blow molding comes with color fading. Even the urethane chamber has a color tinge. The Air bag and outsole have sublimated color fades, while the Cushlon midsole has sprayed on paint. In the 2015 edition, the thing to talk about would be the Max Air artwork. 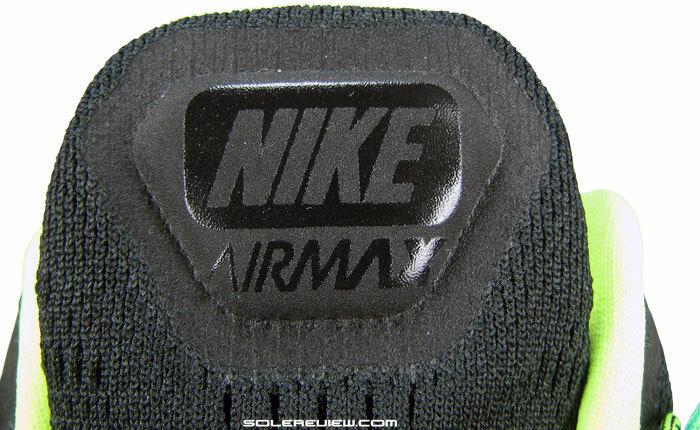 Don’t recollect Nike doing this ever before on a visible Air bag, so it’s a novelty feature for sure. 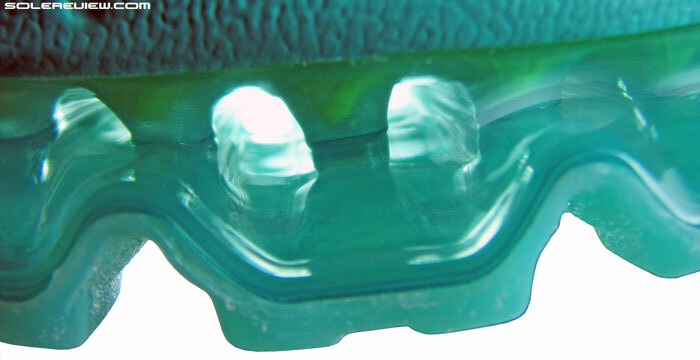 The lateral sidewall of the transparent midsole wall has ‘AirMax’ text emblazoned across, and then graduates into an area with blue coloured tint. Cushlon area in the top line has paint over it, but the Air Bag and outsole actually have the color pigmented into them. We first assumed that the Air bag itself was transparent, and appeared tinged due to the background. A re-look proved otherwise, and it was easy to see that the Max Air bag had a blue tint of its own. For people who have access to Nike ID in their countries, it is also possible to custom tint the midsole in color fades of your liking. You can also spice things up with speckles on the Max Air bag. 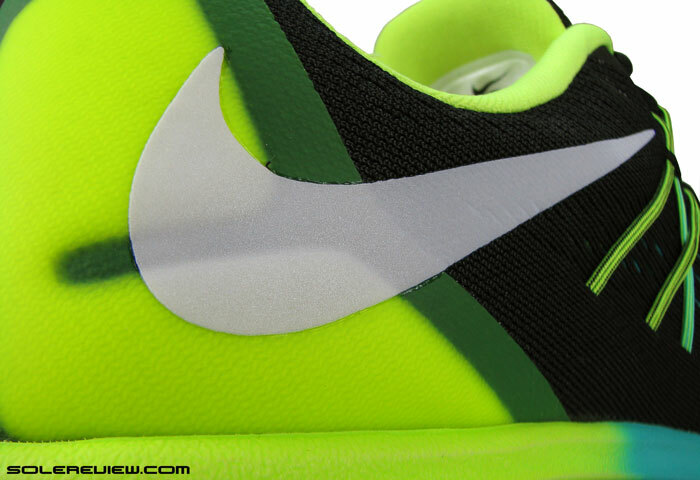 Upper width (2E) is an option only on Nike ID and not on regular retail colors. At least two widths on regular AM15’s would have been nice, as this year’s fit runs slightly snugger. In our upper breakout, we’ll tell you why that has come to happen. Full coverage, translucent rubber with color fades to match. Except that it has no logo. In what’s a rarity, the outsole has no Nike logo at all. 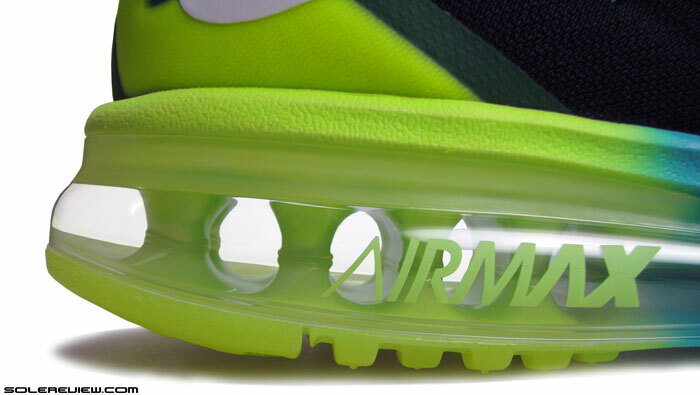 For those who’ve seen the AM 2014, you’ll remember the plastic logo overlay on the midfoot area. That looked tacky, and either Nike thought so too, or just looked at removing the overlay as another cost to save. 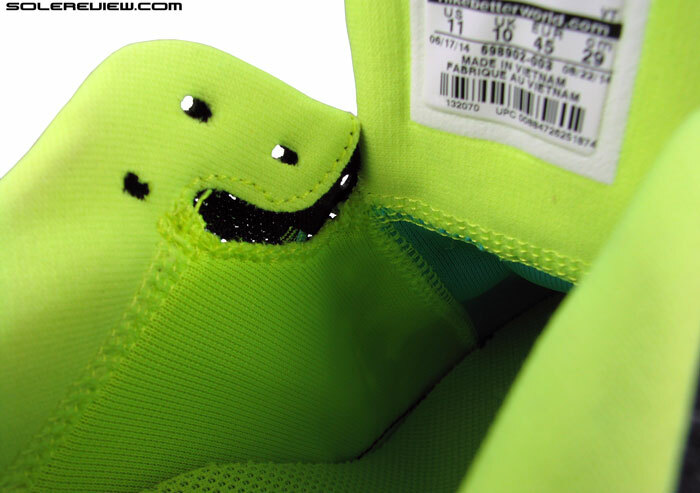 So there you go, no branding anyway at all on the outsole. Is there a bright side to this? Oh yes, though it depends on how you choose to see it. Empty slot where the logo used to be. The Air Max 2015 holds the distinction of being the most knocked-off shoe, months before its retail release. If you’d have googled ‘Air Max 2015’, scores of websites with dubious origins would show up in the results, each displaying what would be a meticulously crafted replica of the shoe. And guess what, most of them have outsole logo overlays. So ironically, the absence of logo is now one of the ways in which you can visually tell legit merchandise from Xeroxed craftsmanship. Engineered mesh makes an appearance on the new Air Max. One main panel extends from toe to tongue tip, and side panels are of a different type. Mesh on the top is spacer type, with a varying knit structure. Mesh panels are joined by fused overlays. Upper undergoes a complete transformation, leaving the packed mesh upper behind. 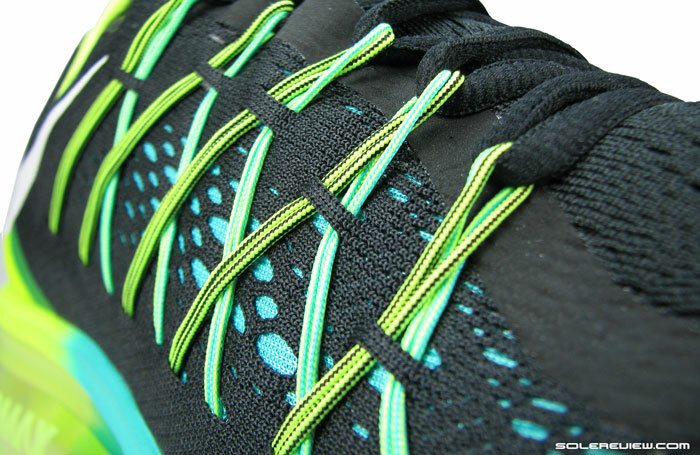 Cord based Flywire makes an appearance, its loops stretching over an all new mesh upper. Instead of the tongue being a separate component, it is part of a spongy textile which begins at the toe box. 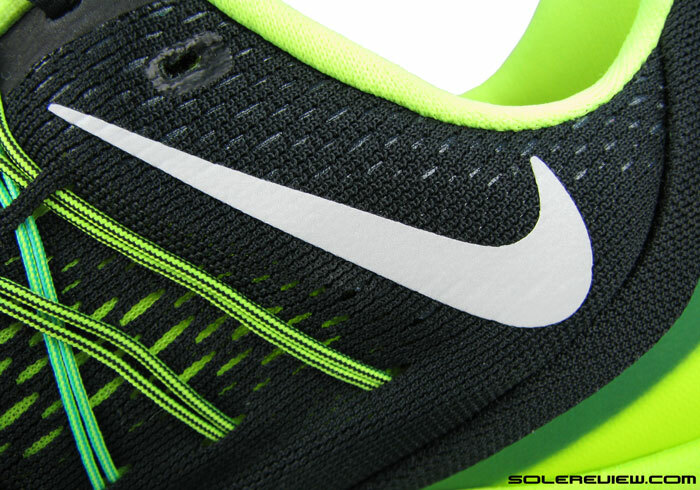 Side panels are single layer meshes which are now seen on a lot of Nike shoes, with perforations and close knit areas. 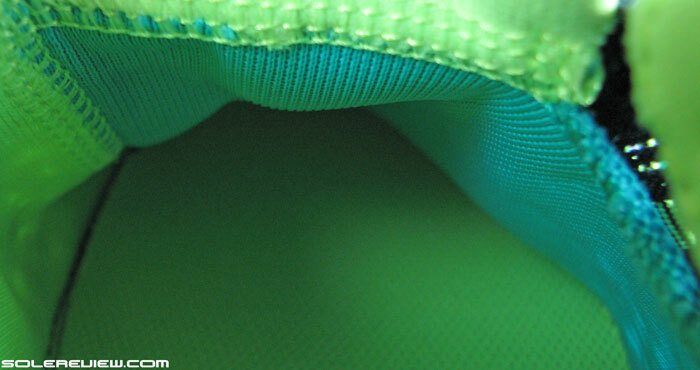 These different mesh areas are joined together with stitch-less, fused overlays. 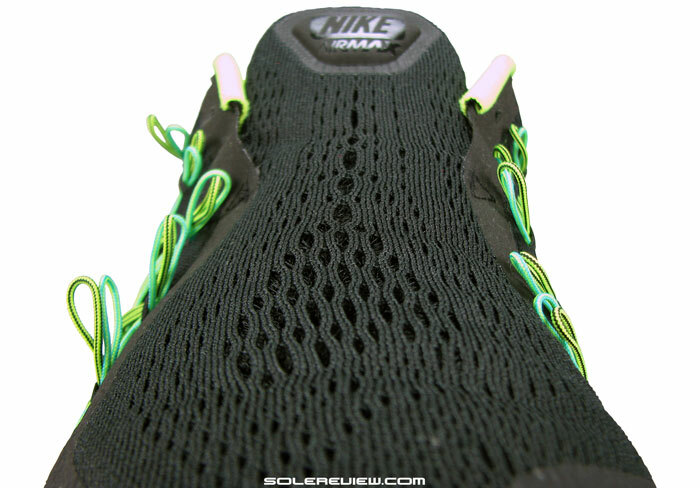 It is worth noting that the Air Max 2013 also had Flywire loops, except that they were underlays between the upper mesh. The Air Max 2014 was a heavy shoe at 414 grams for a US 11. So if the goal of using lightweight mesh on ’15 was to reduce empirical bulk, then Nike has succeeded in doing so. Weight is now down to an acceptable number of 382 gms, and all that slimming has happened on the upper, as the sole remains untouched. With exception of the logo, of course. 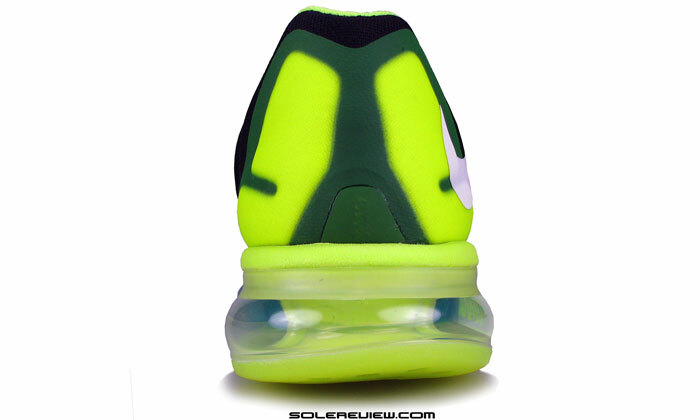 The Air Max 2015 comes internally sleeved this year, which was a missing feature on the 2014’s. We bemoaned the lack of an inner sleeve in the Max 2014, and the Max 2015 makes amends in that department. There’s a full internal sleeve, with less seams that what you would encounter normally. Since the tongue is not a separate component to be stitched in, it allows the shoe to do with one less seam. With the picture just above, we try and show you what that looks like inside. 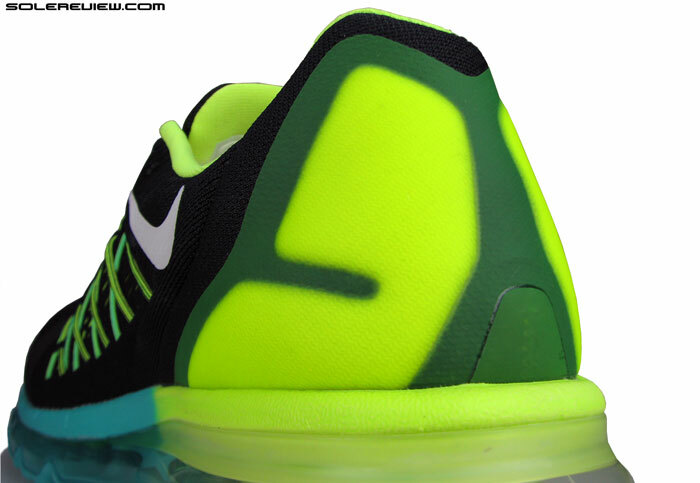 In a recent Nike trend that seems to be catching on, the tongue does not seem to have any foam padding inside. Squeeze the tongue with your fingers, and you’ll notice that the layer of foam which was inside the 2014’s tongue is missing. That’s something which we recently saw on the Structure 18, and going by the pictures, even the 2015 Vomero 10 does it too. The only patch of squishiness is on the AM15’s tongue tip, where there’s a welded-on branding backed with foam. Heel area has laminated urethane overlays on foam. Night time visibility carries over from last year, with both side logos being reflective. 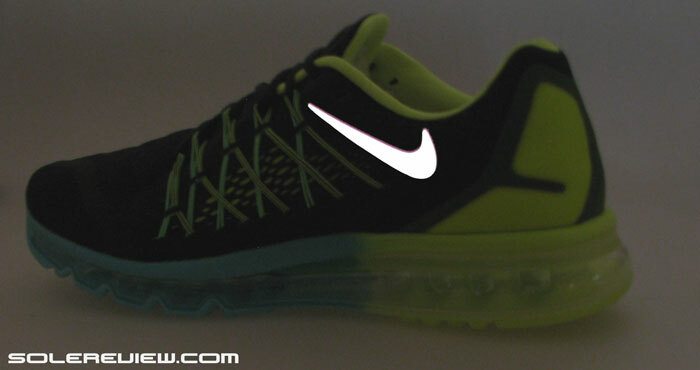 Somehow we felt them to be lacking in reflective intensity compared to Air Max 2014. And both the swooshes have an inverted placement, in case you didn’t notice. 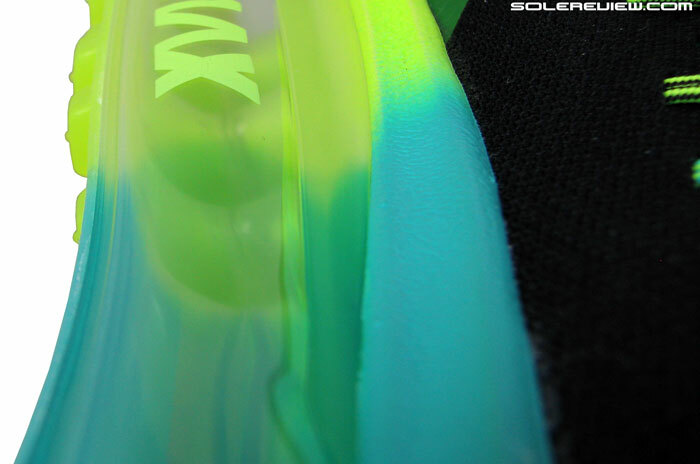 On the heel, the Air Max 2015 sports laminated foam overlays, which somewhat look a bit like flat Zoom Air bags, with the urethane film structure. 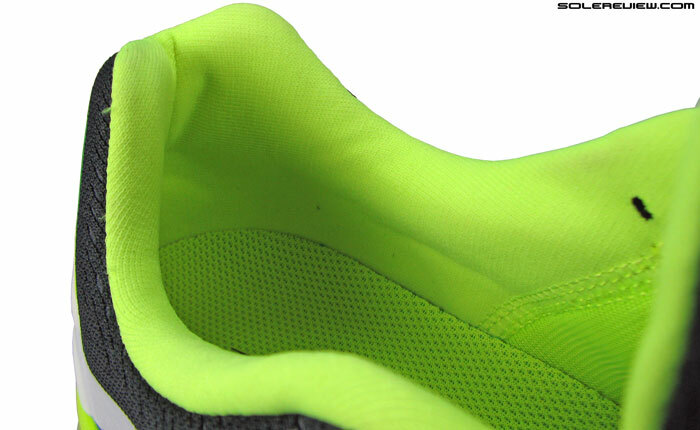 If you cut open that area, you’ll see the foam tightly bonded to the translucent overlay – like a Zoom Air bag. 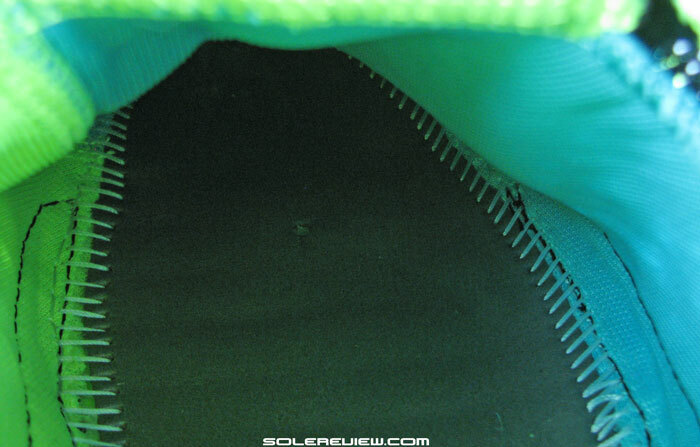 The addition of inner sleeve and Flywire cords lead to a natural consequence, which happens to be fit difference. The upper is now snugger than how AM14 felt, more so in the forefoot than anywhere else. This isn’t a bad thing, as long as you don’t have wide feet. And that is the reason why we mentioned (earlier) that it would have been helpful to have a 2E option in retail colorways. 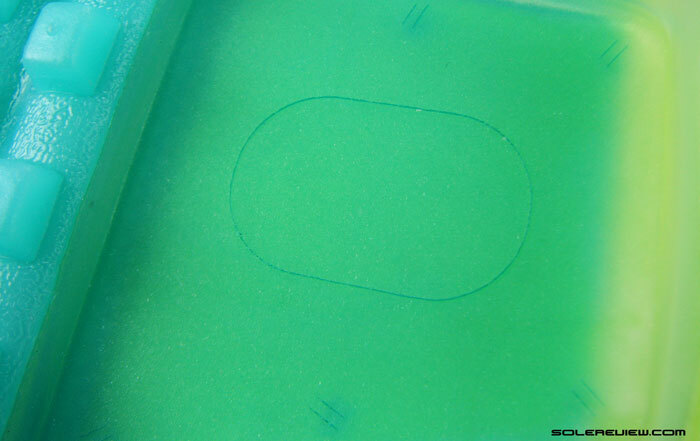 Flywire loops pass through ‘guides’ on the mesh, much like the Zoom Structure 18. Flywire cords extend upwards from inside the upper, and goes over the midfoot panel. Out of the five Flywire loops on each side, only two work together with eyelet holes. 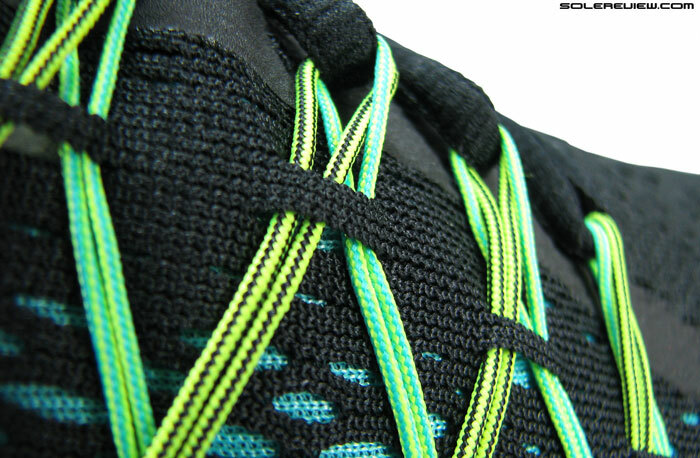 The remaining three connect directly with the lacing, which means that every time you pull on the laces, the cords will effectively stretch taut on the upper. This has the three Flywire cords deliver a higher side wrap pressure than what you might be used to. If you need a relaxed fit, then just don’t tug hard on the front laces. The Flywire cords will still stay flush with the upper, as they are kept in place by the in-built guides. (see picture). Heel fit is excellent. Padded collar walls close in on the foot without any gap, and if you needed to dial up the snugness, there’s that last row of eyelet as a fall back. Toe box seam joins two mesh panels together, but has the effect of hemming in the large toe. Apart from overall snugness, you’re bound to notice the revised shallowness of toe bumper. 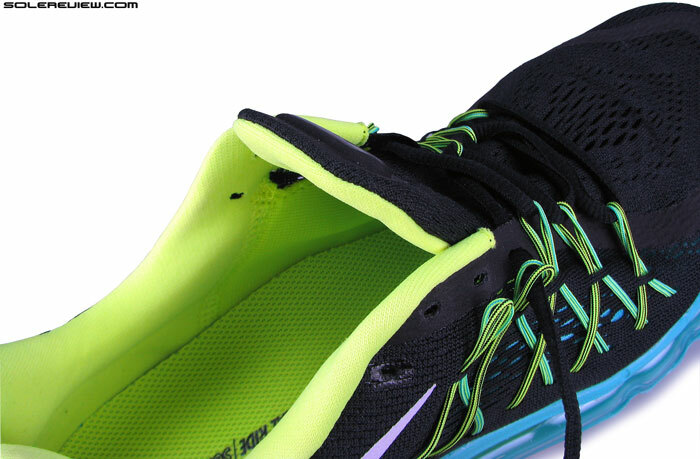 The area above the big toe in AM2014 was mesh, whereas that space is overlaid with a seam in Air Max 2015. That seam cuts right across over the big toenail, and hems in that part of the foot. Not irritating, but a difference you can’t help noticing when swapping up from a ’14. Taking into account the lighter weight, these are the only functional updates you’re likely to discover during a run. From a running usage standpoint, Nike’s alpha-priced running sneaker has always been about more show than go. That’s all the shoe has ever been. Good stuff, how does cushion compared to AM2014? AM2014 is very hard though – at least to me. Same ride as AM2014, no change at all. Buy the Vomero 10 instead, much better for the use you’ve described. Question for Solereview. I am currently suffering from plantar fasciitis due to a previous achilles tendinitis on my right foot. I am currently using AM 2015. What other shoe would you suggest for my condition? I go around a lot so I would have to walk around (despite my condition). Could you suggest an alternative shoe which I can use as an alternate for AM 2015? Thanks. We’re sorry – we cannot recommend shoes for relieving PF. We recommend that you get professional medical advice! I am already undergoing physical therapy for the PF but i am asking for your recommendations for a shoe that will offer good support for my arch and cushioning for the heels . Plus one that i could use all day. Thanks. I am using airmax 2015 and lunar eclipse 2. I think lunar eclipse 2 is about to give out though. You could try the Nike Zoom Odyssey or the Nike Lunarglide 7, in that case. I visited a local Nike store and tried them both on. LG 7 was soft at the heels but quite stiff at the arches (made my foot ache). Zoom Odyssey was a better fit, I bought the Odyssey instead. It feels much better than my Air Max 2015! Thank you very much Sole Review for helping me decide. You’re welcome – happy to hear it worked out. Thank you for coming back and sharing your experience! Thanks for the review. Recently bought a pair of fingertraps( which are extremely comfortable) and considered buying the airmax 2014. After trying them on, and reading many reviews, I decided to take a pass. I really wanted them to be over the top comfortable which was not the case. I have been a Nike fan for years and have several pairs of the lunarglides. Just purchased the LG6 and hope they work! Thanks for the great reviews! The LG6’s are comfortable, and they should work. The Air Max 2014/15 is far from being super comfortable, they actually run quite firm. Think of it – if Air Max was as good as marketed, why doesn’t Nike put it in most of their running shoes? I have the Air Max 2013 and also the LunarGlides 4, 5, and 6. All LunarGlides are softer and more supportive while running. The Air Max is indeed firm and never feel as comfortable as the price would suggest. They also wear very snug and mine are wide width. Still, they are beautiful shoes, better made than the cheaper models, and the height of the bottom helps on rainy days. The Nike Air Max has never been an authentic running shoe. It released in 2006 when big cushioning inserts were still the rage, and subsequently did well in the athleisure/sneaker market because of the way it looks. Nike Airmax 2015 Vs Nike Flynit Max ? A Brief Comparison and Conclusion Please . Haven’t tested the Flyknit Max, but it shares the same outsole with Air Max 2015. Both are very average, overpriced running shoes. I have been looking at a running shoe that’s a step up from the entry level name brand trainers that have used for some years. Needless to say my feet are demanding an upgrade. I run short distances (1-2 miles) and the rest of the time is spent at the gym. I am leaning torwards the nike airmax lunar1. It sounds like the lunar sole makes a big difference with weight and support. Any one else have experience with these shoes? Both the Air Max 2015 and AM Lunar 1 aren’t great running or gym shoes. The AML-1 is a lifestyle sneaker. We recommend something like the Pegasus 31, which will work better for both activities. I agree with that. I have two Pegasus 30s in extra wide width (option you can only get on the Pegasus) and you can do anything with them from running to gym work to cardio…even hiking. They’re pretty light shoes. My Air Max 2013 and LunarGlides 4, 5, and 6 don’t feel quite as versatile as them, maybe because of the heavier weight though it could be because they are only in the standard wide width. Thank you for sharing the insights! hi, is the air max tailwind 7 more cushioned and responsive than the air max 2015. Which is lighter. Don’t know about weight, but the Tailwind should be more cushioned than AM15 due to use of low pressure Ramp Air bags. The Tailwind’s got plenty of air, alright, but just at a lower pressure than say, an Air Max 2014/15. Softer yes, responsive not so much. Just give them a try at the local store, you’ll get a good sense of both the Air Bag types. Hi i just found your review and have got to say they make for a great read. The 2014 & 2015 Air Max reviews are fantastic, and i agree with everything you say. Did you not do a review for the 2013’s? Imo the 2013’s are the best to date and definitely warrant some of your focus and possibly a review. Hey, thanks for visiting solereview! Yes, haven’t reviewed the 2013 – appreciate the feedback. Won’t be reviewing it, though – time and money both are a constraint. Can i ask which Air Max are your personal favourites out of the 2013’s 2014’s or 2015’s? The AM 2013’s for sure. Yes, a lot of people are surprised when the Air Max doesn’t ride as soft as it looks! They are definitely more show than go. Will these be good for a person suffering from plantar fasciitis / heel spur problem? BTW any other you would like to recommend. My main purpose is walking. It would be best to consult with your physician, though general rule of thumb states that shoes with a firm/supportive midfoot and heel area combined with proper forefoot flexing area does well. Shoes like the adidas Glide Boost 6, Nike Pegasus 31 come to mind. hey Is my nike womens air max 2015 defected?? my tounge of my shoe keeps sliding back to one side and is very uncomfortable why is this? That’s strange. 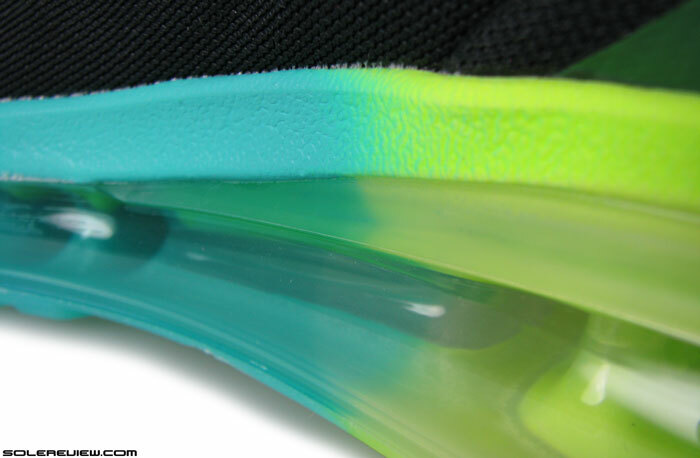 The Air Max 2015 has an inner sleeve, so there should be no tongue slide. Hi there, your reviews are amazing and very interesting! For the past 3 years I have used Nike Lunar Eclipse 2 then Lunar Eclipse 3 as a shoe not for running but mainly for everyday wear and various sports; especially basketball, netball, tennis etc. This has been good and honestly I had gotten them mainly on the basis of aesthetics. The LE3s have definitely worn out since being bought in September 2013 and I am due for a new pair of aesthetically pleasing nikes! I was wondering whether the Nike Air Max 2014 or 2015 would cope with these kinds of activities? Some people I know have said the air bags on their Air Maxes (2014) had popped which is another thing I fear for a runner at such a high cost. I have a narrow, low arched, mild over pronating foot and always run in 2A width Asics GT 2000 series runners which I love. I am guessing the Air Max wouldn’t be a healthy choice given my feet characteristics that require good support? I have considered the Lunar Glide or continuing with the Lunar Eclipse but I’m not sure what I should do! Hi Clem, thank you for the comment! We would not choose the Air Max 2014 or 15 for a couple of reasons. One, the outsole does not have as much grip as the Lunareclipse. Two, the blow molded airbag is far more prone to damage during the kind of physical activity you will be subjecting the shoe to. This shoe might suit you for running though, as there is enough support – Air Max 14/15 isn’t as soft as many think it is. Would advise something like Lunarglide 6 instead. untill 2013 i never had nike running shoes. I tried the 2013 version of this shoe. After less than ten short runs the sole was perforated by a little twig. Could not use the shoes anymore. Howver nike had excellent service, got a full refund and bought the vomero’s. Cheaper and far more better running shoes. Today i gonna look for the nb fresh foam or the adidas boost. The air max 2013 and so on are more lifestyle shoes. Yes, most of the Air Max shoes are gimmicks, and running is better done in their core products like the Pegasus, Vomero and Structure. if i got these at half the cost would it be a good buy or should i opt for asics? It really depends on what you want out of your shoe. would they work for distance running ? Too clunky and lot of work. Of course, you can run long distance in almost any running shoe, but the AM2015 isn’t the ideal product choice. GL getting them for only $90. Footlocker is the only place that has them on sale for $150. They are a comfortable running shoe, but they aren’t worth this price. My $40 Reeboks were lighter than this shoe. I guess I’ll have to see how long this Nike lasts. Hello, I have a question about shoes, I’m working in hospital(doctor) and sometimes I work 24-30 hours without break on my foots, my big toe is always hurts(medical problem, not about shoes but shoes help me to feel it less). My legs always tingling. Why I wrote these? I want to give you information about what should I buy. I’m using Nike half air max(only at backfoot) and my big toe hurts. Can you recommend me this shoes? Or what shoes should I buy? I want these on my shoes; Max breathable my foots, max comfort, max cushioning.. Thank you very very much for reply. I need help because nobody know anything to help me in my place..
Hello Doctor, don’t buy the Air Max 2015. You should try either the Asics Nimbus 17 or the Nike Zoom Vomero 10. Both these shoes are very comfortable for long hours but different in many ways, so give them a fit try at your local stores. These are popular models, so every retailer should have them in stock. The Nimbus is more breathable and softer than the Vomero. The Nike in comparison has a much wider upper in the front, which should take the pressure off your toes. Try Dnsko shoes. Those are really good if you are standing for long hours. What is the best shoe for Plantar Faciitis problems? Hard to say. It depends on what your podiatrist/physio has suggested, and also based on which shoe’s currently working for you without causing issues. I have a sore right heel that hurts when the heel strikes the ground. Please refer to our comment just below. Pls suggest me the better shoes in terms of durability…..Nike airmax or Adidas springblade? The Air Max outsole is more durable, though the Air bag midsole has a risk of puncture if used under less than perfect conditions. But regardless, the Air Max is a better shoe than the Springblade. Hi i am planning to buy my first air max but i am not sure how they are gonna turn up,i need new pair for my gym,i have used nike lunar glides,zoom,vroom,free etc etc in the past and they all have been decent but i am afraid that air max would restrict my workouts in a certain way due to its height,please suggest should i go for the lunarglide or the pegasus or the air max? Out of the three, the Pegasus is more suited to gym workouts. Not the same shoe. But looking at the pictures, both have the same sole. Only upper change. Beyond that, can’t say – we have no miles on the Pacfly. Hello! Next year, when Airmax 2016 comes out, should I purchase the “normal” or Flyknit version of the shoe? Depends on how you want your shoes to look! Both the shoes will ride the same, however. Hi, can the air max 2015 hold heavy weights like me? i weigh over 79 kilos. Sure. And try the Vomero 10 too. tnx! btw great reviews really helped me alot! We don’t know of any method to fix that, sorry! Hi I have a 9 inch foot (woman). 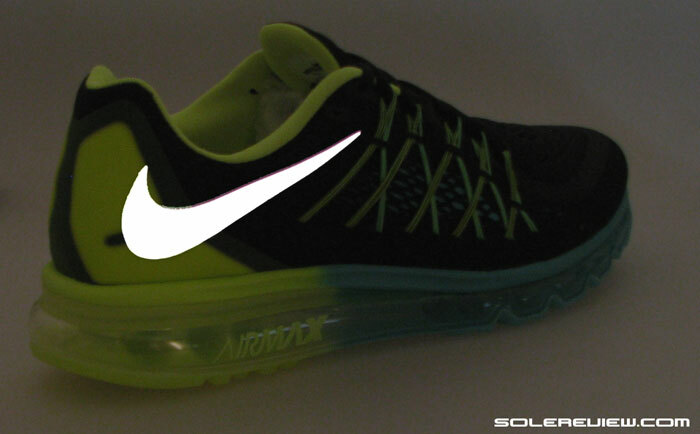 planning to but nike air max 2015. going by conventional size standards, I should buy size 4 (uk). But that would be too tight for a running shoe. I need some shoe space for running. Would a size 5 or size 6 be suitable. Are you wearing any shoe which is close to an athletic shoe? Like a walking shoe? What is your sizing on those?